From Josh Weinfuss's "Floyd Breaks Out In Finale"
Punter Dave Zastudil held off Kansas City’s Dustin Colquitt to earn a spot in the NFL record books Sunday afternoon. With two punts downed inside the 20-yard-line, Zastudil finished with 46 for the season, the most in NFL history. Colquitt, who came into Sunday with 42, had three punts downed inside the 20 against the Denver Broncos. Zastudil said he didn’t think about the record very much this week, but knew he was two ahead of Colquitt after last weekend. 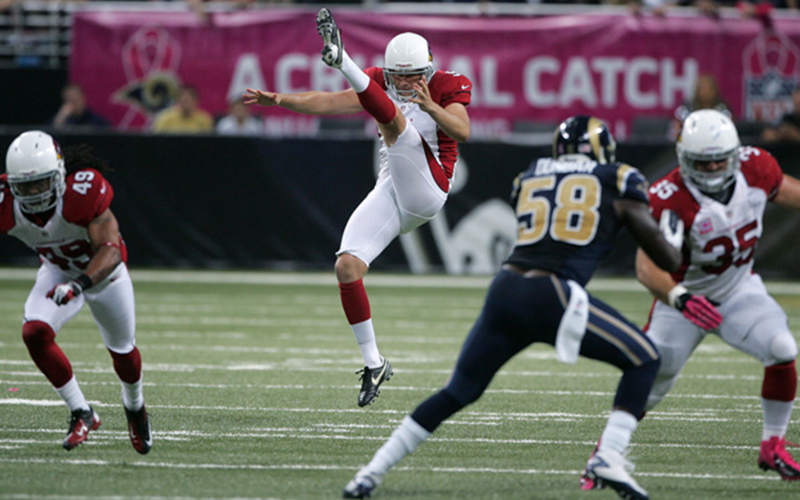 The 11-year punter deflected much of the praise to his gunners and offensive line, but his teammates, kicker Jay Feely and Mike Leach, who snapped to Zastudil on all 46 record-breaking punts, wouldn’t let him celebrate in peace following the game. “I’m humbled to be among some great punters,” Zastudil said.